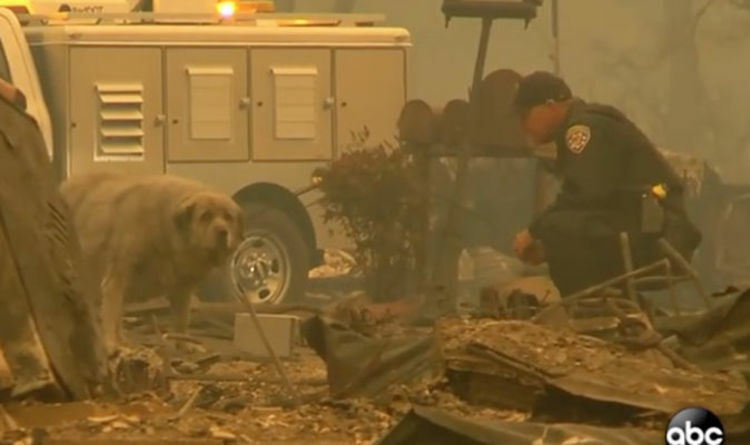 The traffic cop helped pull the terrified pet to safety as the fight to prevent loss of life – both people and animals – intensifies amid the flames that have raged across the Golden State. Harrowing scenes of pets and livestock trying to escape the fast-moving inferno have made bulletins across the United States with the human death toll rising by the hour. Already 31 people have been confirmed dead and as many as 230 others are still missing with the fires tearing across forests and valleys at high speeds and destroying everything in their paths. Celebrities, including Gerard Butler, Lady Gaga and Kim Kardashian, have been forced to flee their mansions over-looking the beaches of Malibu. The 25 year old devoted animal lover’s words highlighted the commitment rescuer workers are placing on saving innocent creatures great and small. CHP patrolman Todd Newman was filmed by an ABC camera crew when he went to help a terrified dog amid the rubble. Teams of first responders and animal welfare volunteers have been working ceasely to bring lost and stranded animals to sanctuaries that are now brimming over with four-legged refugees. At one stage fire officials turned the famous Zuma Beach into a modern day Noah’s Ark with residents from the Malibu area bringing their horses, ponies, dogs and even alpacas to the shoreline to protect them from advancing flames. Other teams have worked round the clock to patch up pets with singed fur and burns. The impact the fires have had had on California’s natural landscape will take months to evaluate. More than 83,000 acres of pine woods and chapparal scrub has been incinerated, much of it home to black bears, cougars, coyotes and host of smaller wild mammals and birds which make the state one of the richest areas in America for wildlife. Yet amid the flames there is hope. An ABC film crew also caught the touching reunion of one man whose house was left still standing but who arrived home to find his horse unscathed.